Bangor University appears in the second round in the 50th anniversary series of TV’s most challenging quiz show; University Challenge on BBC 2 Wales at 8.00 pm on Monday 28 January 2013. The Bangor University team, who beat Scottish university, St Andrews by 125-105 in the opening round, was selected from over 100 students who applied to take part. They are: Bangor University Team Captain, Nina Grant, Simon Tomlinson, Mark Stevens, Adam Pearce and Team reserve, Catriona Coutts. 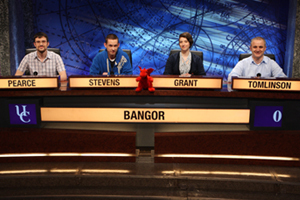 Bangor University's University Challenge Team. Team captain Nina Grant comes from Enfield, in London and is 26 years old. She studied A levels at both Barnet College and Westminster-Kingsway, and went to school at Palmers Green High School for Girls. Welsh speaker, Adam Pearce, from Barry, south Wales, a former Ysgol Gymraeg Glantaf pupil, is reading for a PhD in Translation Studies. Mature student Simon Tomlinson from Manchester is studying a PhD in Neuropsychology. Prior to studying at the School of Psychology he has studied at Birkbeck University of London and Manchester and Leeds (Universities?). Forty year old Simon says: “University Challenge is the best quiz on TV - and I’ve wanted to have the opportunity to take part for years. I was a bit wary as I think it should just be for young undergraduate students, but I suppose I'm flying the flag for 'mature' students”. He adds: “Jeremy Paxman is surprisingly affable. Roger Tilling has an amazing voice. The teams we met during filming were really nice. 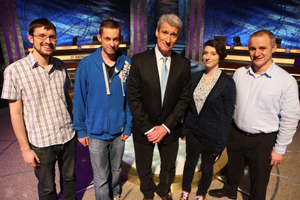 We've no idea as to how we'll come across on TV so are just hoping we look ok!” Bangor University's University Challenge Team with question master, Jeremy Paxman. Mark Stevens is studying for an Environmental Science degree. Catriona Coutts, from Gaerwen, is now in her second year studying English Literature with Creative Writing. She has lived on Anglesey since she was 2 and went to Ysgol David Hughes in Menai Bridge.